Known by many as the “hottest show in Branson” as well as one of the most family-friendly shows in Branson, Pierce Arrow Theatre offers an elaborate live show that features multi-talented performers. With this unique show, guests can enjoy a cast of American idol winners, Guinness Book of World Record for lowest bass singer performer, top Branson comedians, and many more as they perform on a moving stage with special effects, extravagant costumes, and elaborate lightings. Pierce Arrow Show in Branson gives audience the chance to enjoy some of the most popular country songs of all time from classic and traditional country music that you grew up listening to, to today’s contemporary hits. Aside from being known as one of the most popular shows of its kind in Branson, Pierce Arrow is no question features the very best in country music. The amazing performances of the multi-talented entertainers of the show features one of the most impressive stage acts that you can see anywhere that share some of your favorite country songs from the classics to modern music. The Pierce Arrow Quartet performs one of the most high-energy and fast-faced acts in town. This show is one of the most frequently visited shows in Branson where visitors return year after year to see the remarkable display of live music, amazing vocalists, and songs that audiences of all ages have come to know and love. In addition to the traditional and classic country songs that the entertainers perform on stage, you will also hear a selection of some of the most soul-moving gospel songs to be heard on any stage. The quartet is composed of Dan Britton singing bass, Scott Fraker singing baritone, Tony Turner singing tenor, and Travis Spat singing lead vocals, an awe-inspiring show full of amazing talents. With more than 3 million tickets sold, Pierce Arrow Show features award winning comedy and sensational music sung by the amazing Pierce Arrow quartet. From the lowest bass singer to melodious songs, these gentlemen will give you a show that has it all. Together, these multi-talented musicians have been admired for their many talents and achievements, including opening for Sarah Palin, opening for President George W. Buss, Finalist on American Idol, appearing on the Bob & Tom Show, sharing a stage with Jay Leno, and many more fantastic accomplishments. The performing quartet is accompanied by 2015 Comedian of the Year, James Sibley who will continue to be Branson’s funniest comedian. Sibley has written many skits for Saturday Night Live and appeared on the television show ‘My Name is Earl’. As a man of many accomplishments, Sibley will have you laughing that will let you move to the edge of your seat. The Pierce Arrow show delivers a truly unforgettable experience that is full of comedy, great music, and first-rate entertainment. 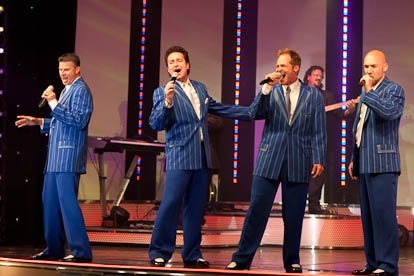 So, if you’re looking for a family-friendly show in Branson that offers an elaborate live show featuring multi-talented singers, watch the Pierce Arrow quartet as they deliver unique musical performance.